The Sawyer Voyager Canoe Paddle is a pleasure to behold, and if you get your hands on one, you'll feel the water as never before. Simply the finest paddling blade crafted of laminated Western Red Cedar and Douglas Fir. The blade is reinforced with fiberglass and trimmed in our Dynel ToughEdge, an impact and abrasion protection usually reserved for extreme whitewater blades. Molded palm grip is reinforced with Ash. A prime companion for all your wilderness adventures. The Sawyer Glide Canoe Paddle is a high value recreational paddle and paddles well beyond its modest price. Features a smooth, comfortable pear grip, an indexed oval shaft, and a molded blade that feathers cleanly through the water. A handsome, all wood paddle that fits into any paddler's budget. 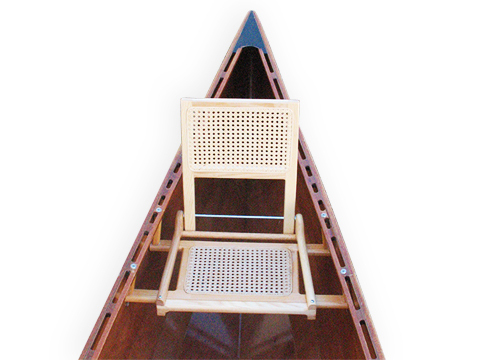 Available lengths: 54" 56" 58"
Lightweight, slip on cane canoe seatback / backrest. Easily converts your standard canoe seat into a comfortable chair for paddling. Hooks on to front of your existing cane seat; needs no mounting hardware. Fits on Taiga Canoe seats and other seats with a maximum depth of 11" and a maximum thickness of 7/8". Folds for easy storage.Wood is vermont white ash.